CHP gives everyone a chance to experience the value of agriculture and a new respect for fruits and veggies! Our volunteers work outside, rain or shine, since hunger doesn’t stop because it’s raining. Depending on the time of year, our volunteers assist in our greenhouse planting seeds, planting seedlings in the fields, tending to the plants, harvesting, washing, and boxing produce. This is a great place where children can learn at a young age the value of helping their community solve a local problem. Individual volunteers and families can stop by for our drop-in hours: Monday-Saturday from 9am to noon. Swing by and help out for as long as you are able! No gardening or farming experience is necessary. Staff, Team Leaders, and other volunteers will be on site to get you started! Feel free to bring your friends or family and spend the morning making a difference. Children and adults of all ages are welcome, but if they are under 16 they must be accompanied by an adult. Community Harvest Project (CHP), a 501(c)3 organization, is dedicated to improving access to healthy foods through community engagement. 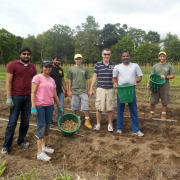 Through their volunteer farming, education, and volunteer programs and partnerships, they bring thousands of community members together each year to build an engaged and healthier Worcester County. In 2018 working together with over 8,500 volunteers they produced significant fresh produce resources for individuals and families in need throughout our community who otherwise may not have had access. The produce is donated through numerous partner organizations such as The Worcester County Food Bank, Community Servings, Loaves and Fishes, Jeremiah’s Inn, and The Hector Reyes House. CHP operates at Brigham Hill Community Farm and White’s Farm in North Grafton, MA and at Prospect Hill Farm in Harvard, MA. For more information about their programs and impact, please visit www.community-harvest.org .